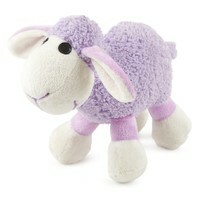 Ancol Small Bite Plush Lamb Toy. Designed especially for smaller dogs and puppies, the Ancol Plush Lamb has been created using luxuriously soft materials that are gentle on their skin and mouths. The toy is of a much smaller size than most toys, which coupled with the soft materials, makes it an ideal comforter for your dog to snuggle up to after they've finished roughing it up. Not suitable for dogs that like to chew. I bought 2 of these lambs' one for my dog who loves squeaky soft toys and one for a friends dog who is grieving the unexpected loss of her sibling. Both dogs carry these lambs everywhere and the friends Sammy treats the lamb as if it's a puppy. While playing with it yesterday, their neighbours elderly dog came to see the toy and fell in love with ve, so am ordering another for him. While good quality, the lambs are soft toys and so aren't suitable for dogs that love to chew and rip, but if your dog loves soft cuddly toys, you won't be disappointed. Ours goes everywhere and has withstood 2 washes with no loss of stitching, loosening of seams, etc and the squeaker is still working too. Normally I don't put the plush toys in the dryer, but had to put 'lambie' in the dryer one night as our dog snuggles with her at night and it was still wet. I was impressed that she looked as good great coming out of the dryer and apparently the warmth made her extra snuggly that night. The dogs love them and for the price, you can't go wrong! I actually purchased the Ancol Small Bite Plush Lamb Toy for my guinea pig to cuddle because he loves fleece, but I wish I had bought another for my puppy, as it's the perfect size for little mouths and has a squeaker inside. I don't imagine it would last long with an adult dog or cat though. The eyes are just black thread sewn into a circular shape, so there are no plastic parts for your pet to choke on.